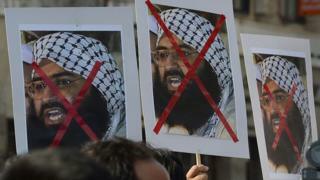 Masood Azhar is the leader of Jaish-e-Mohammed (JeM), which carried out a deadly suicide bombing killing 40 troops in Indian-administered Kashmir. The UN security council has been asked to subject Mr Azhar to an assets freeze, travel ban and arms embargo. But China said it needed more time to examine the request, asking for a hold. The postponement could last nine months, and it is the fourth time China – a close ally of Pakistan – has blocked attempts to have Mr Azhar designated as a terrorist. The Indian government thanked other member states who moved the proposal, brought forward by the US, Britain and France. It said in a statement it would continue to pursue “all available avenues to ensure that terrorist leaders who are involved in heinous attacks on our citizens are brought to justice”. The Chinese mission to the United Nations had told reporters it was attempting to uphold a “responsible attitude” and seeking to deal “with this issue with relevant parties via thorough consultation”, news agency AFP reported. Sources have told newswires there is a strong case for designating Mr Azhar as a terrorist and have hinted that they may pursue “other avenues” if China continued to stand in the way. Pakistan-based Muslim cleric Masood Azhar founded the group after he was released by India in 1999, one of three men set free in exchange for the crew and passengers of an Indian Airlines plane hijacked and flown to Taliban-ruled Afghanistan. Mr Azhar reportedly met with the former Taliban leader Mullah Omar and with al-Qaeda head Osama Bin Laden when he was in the country. India blame JeM for an attack on its parliament in New Delhi in December 2001 – a claim JeM denies. JeM was officially banned in Pakistan soon after that attack, but the group still operates, sometimes using the names Afzal Guru Squad, Al-Murabitoon and Tehreek-al-Furqan. More recently, India has blamed JeM for an attack on its Pathankot airbase near the Pakistani border in January 2016, which left three security forces dead. JeM commander Noor Mohammad Tantray was killed by Indian forces in December 2017, which was seen as a massive blow to the organisation. But the violence did not abate, and a report in the Indian newspaper The Print suggests covert Pakistani support may be the reason for its expansion. JeM has however attacked Pakistani military targets and even made an attempt on former leader Pervez Musharraf’s life in 2003, despite India’s accusations that Pakistan harbours the group. Read more: What is militant group Jaish-e-Mohammad?